Fully renovated throughout, this stunning home is ready for its new owners. There is so much to love from a sprawling floorplan to a gorgeous in-ground pool and central location, you will want for nothing. The spacious layout offers almost 3000 sq ft of living space with four large bedrooms including the master bedroom with a walk-in closet and a master bath with twin sinks and a jetted tub. Oversized windows feature throughout, allowing an abundance of natural light to flood the home while the entire interior has been beautifully updated so you can move in knowing all the hard work has been done for you. The kitchen is well-equipped with a suite of stainless steel appliances, plus a beautiful pine ceiling and parquet floors that continue into the family room, creating the feeling of one big, gorgeous great room. A wood burning fireplace in the family room creates a cozy ambiance on those cold winter nights. There is also a formal living room with a fireplace and access out to a lovely deck where you can take in seasonal views. A gorgeous formal dining room is ready for your next dinner party, while the huge basement is just waiting for the finishing touches to create the ultimate recreation room. Outside, the 1.5-acre lot provides a spacious yet low-maintenance yard. A sparkling in-ground pool will be a favorite place to relax throughout the summer. Extra features abound and include an attached two-car garage, central air-conditioning for year-round comfort, a central vacuum system for easy-cleaning and two sheds for an abundance of storage. Custom blinds have been installed on the windows and there is a laundry room housed on the second level, offering complete convenience. Just as impressive as this beautiful home is its central location. 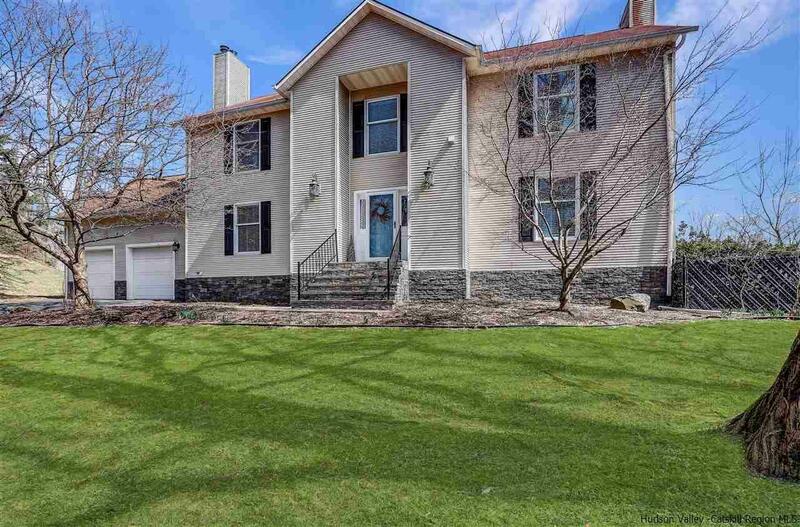 You will live close to Kingston, Saugerties and Rhinebeck, while the NYS Thruway and Amtrak are only moments away.